What's in the bowls, you ask? Fresh, raw grape-apple sauce made from local concord grapes (across the road from me) and local apples (Thank you, Anna Campbell!). I have been making this fresh, every morning, by chopping apples with their skins intact and putting them into the blender. Pull grapes from their vines, seeds and skins intact, and toss into the blender. 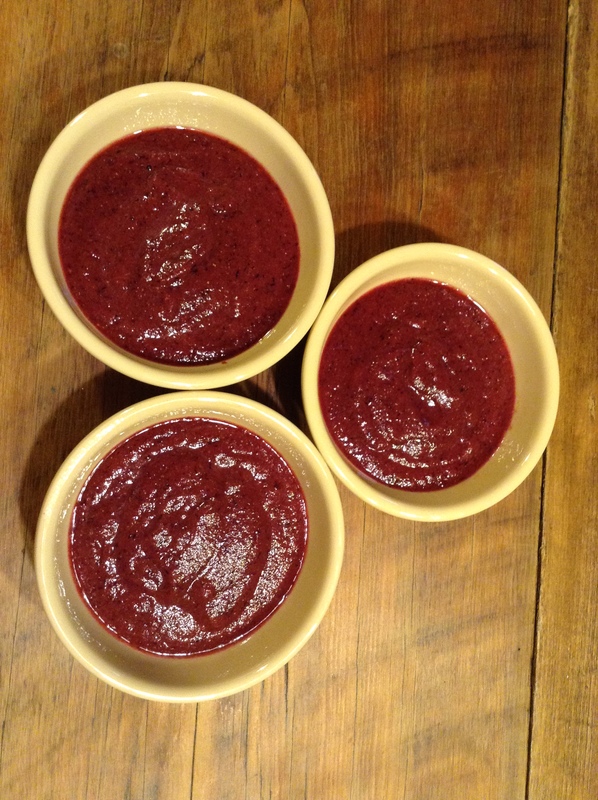 Blend on high speed until a well blended sauce, pour into bowls and enjoy! BENEFITS: The benefits of local foods is that the nutrition is intact. The food is fresher as it has not been transported thousands of miles. Apples and grapes are an amazing cleansing AM food for the liver and colon. The skins are loaded with phyto-nutrients. The grape seeds, well, they are too. People pay good money for grape seed extract and yet spit the seeds out of the grapes they are eating. What? Grind them up, glean the benefits of the seeds! The nutrition in both fruits is low sugar and feeds the body cells with an amazing array of nutrients (most of which we know nothing about nor have a name / label for them!). It is a fall food to enjoy until they are gone, knowing that next season they will be back to enjoy again.